When I received an email from the Daily Mail letting me know that a San Francisco man posed as a 26-year old dog named “Hero” on Tinder, I had to chuckle. After all, a dog is man’s best friend and every girl is looking for her hero. Still since Justin Mateen, co-founder of Tinder believes that their mobile app is a social discovery app and not a mobile dating app, I wasn’t surprised that this social experiment was received as a breath of fresh barking air. The responses flooded in from both women and men within a 100-mile radius. It’s a social networking experience, and people love pets, so it was certainly a way for the profile to stand out among the millions of other profiles that users are swiping right and left to. “Hero” a golden retriever, replied to curious swipers with a “woof woof” and “bark bark” with an occasional wagging of his tail. After seven days as a male dog, Joe Veix posted that had 206 matches—154 guys and 52 girls. All of his responses were “woof woof” and occasional digital barking. When he switched to a female dog, the comments became a bit riskier. Rather than saying, ‘hey’ or ‘what’s up’ the “Hero” puppy profile allowed users of the app to have a bit of fun and laughter while responding to the barks from the dog profile. READ: IF MISS USA IS ON TINDER, SHOULD YOU BE? Tinder now claims 10 million matches a day and over 800 million swipes a day. Users are logging on for more than 1.5 hours a day. 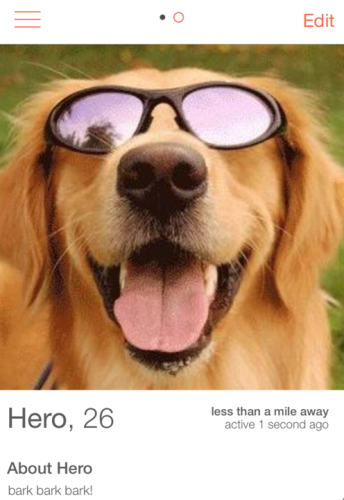 Will the future of Tinder fall into the hands of your four-legged pets? I think it’s just a matter of time, before we’ll see a viral cat video on Tinder. Are you dating on Tinder? Your comments are welcome. Julie Spira is America’s Top Online Dating Expert and Digital Matchmaker. She’s the host of Mobile Dating BootCamp and helps singles find love on the Internet and IRL. For more online dating advice, follow @JulieSpira on Twitter and sign up for the free Weekly Flirt newsletter.